Orestis Terzidis heads the Institute for Entrepreneurship, Technology Management and Innovation (EnTechnon) at the Karlsruhe Institute of Technology (KIT). 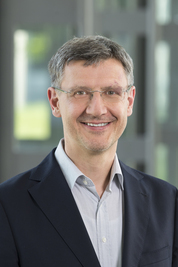 After earning his doctorate in physics, he worked from 1998-2011 for SAP, initially as an application developer, and later as an assistant to the CEO Henning Kagermann and director for the SAP Research Center in Karlsruhe. In October 2011 he joined the KIT as full professor. Sprecher der BDI Arbeitsgruppe ‚Internet der Energie'. Mitglied des Präsidiums des Förderkreises Gründungsforschung (FGF) e.V. Mitarbeit an der AG ‚Geschäftsmodelle' der acatech Plattform ‚Lernende Systeme'. Hatzijordanou, N.; Bohn, N.; Terzidis, O. A systematic literature review on competitor analysis: status quo and start-up specifics [in press]. Management of Partner Ecosystems in the Enterprise Software Industry. Monitoring Energy Entrepreneurship - Descriptive analysis of startup activities within the German energy sector. Seitz, C. S.; Beuttenmueller, O.; Terzidis, O. Organizational adoption behavior of CO2-saving power train technologies: An empirical study on the German heavy-duty vehicles market. Metzger, J.; Terzidis, O.; Kraemer, N.
Value delivery architecture modeling-A new approach for business modeling. Hartelt, R.; Wohlfeil, F.; Terzidis, O. Process model for technology-push utilizing the task-technology-fit approach. Value Delivery Architecture Modeling - A New Approach for Business Modeling. Metzger, J.; Kraemer, N.; Terzidis, O. Maturity Models and Action Quality: Approaching the Effects of Entrepreneurship Programs in the Light of the Intention-Action Gap. Henn, R.; Siegele, J.; Terzidis, O.
Longitudinale Studie zur Analyse des regionalen Gründungsgeschehens in Karlsruhe. A Critical Success Factors Model for Radical Technological Innovations. Wohlfeil, F.; Terzidis, O.; Hellmann, L.
Radical Technological Innovation - Comparison of a Critical Success Factors Framework with Existing Literature. Strategic Approaches for the Realization of Radical Technological Innovations within the Manufacturing Industry. Russ, J.; Terzidis, O.; Singh, M. D.
The Impact of the ObamaCare Excise Tax on Innovation and Entrepreneurship - Early Empirical Findings. Guiding behavior favoring sustainable enterprise innovation capability (SEIC). Development of knowledge workers dealing with complexity. Terzidis, O.; Zientek, M.; Presse, A.; Neumann, T.
Analysis of Crowd-investing Startups in Germany. Market Penetration of Alternative Power train Concepts in Heavy Commercial Vehicles : A System Dynamics Approach. Critical Success Factors for the strategic management of radical technological innovation. Briegel, F.; van Dinther, C.; Jahn, B.; Weidlich, A.; Terzidis, O. Impulse für eine smarte Energiewende. Handlungsempfehlungen für ein IKT-gestütztes Stromnetz der Zukunft. Terzidis, O.; Presse, A.; Metzeler, F.
Creativity in Teaching and Learning - Existing Concepts and new Formats. Brandenburger, M.; Frank, G.; Presse, A.; Terzidis, O. Business Angels Decision Criteria in New Ventures in the Seed and Early Stage Phase. Brandenburger, M.; Terzidis, O.; Presse, A.
Terzidis, O.; Parrisius, J.; Ziegler, C.; Presse, A. Success Factors of German E-Ventures in the Early Stage Phase. Riederer von Paar, A.; Terzidis, O.; Presse, A. Identification and Evaluation of Key Success Factors regarding New Product Development Processes in small, early-stage entrepreneurial Firms. Schneider, J.; Terzidis, O.; Presse, A. Analysis of Social Media Marketing in Technology-oriented Start-ups. Mostaghim, S.; Presse, A.; Stroisch, P.; Terzidis, O.
Multi-objective Optimization as a Methodology for evaluating Success Factors for Start-ups. Open Access am KIT. Presse, A.; Brandenburger, M.; Terzidis, O. Investment Criteria for Business Angels in Germany. Presse, A.; Metzeler, F.; Terzidis, O.
Appelrath, H.-J. ; Terzidis, O.; Weinhardt, C.
Internet der Energie : IKT als Schlüsseltechnologie für das Energiesystem der Zukunft. Mayer, C.; Breuer, A.; Dänekas, C.; Drzisga, T.; König, A.; Luhmann, T.; Maerten, M.; Rohjans, S.; Stadler, M.; Terzidis, O.; Theisen, T.; Weidlich, A.
Technologische Migrationspfade in das Smart Grid. Internet of energy: ICT as a key technology for the energy system of the future. Terzidis, O.; Oberle, D.; Friesen, A.; Janiesch, C.; Barros, A. The Internet of Services and USDL. Adam, R.; Böse, C.; Bomarius, F.; Bretschneider, P.; Briegel, F.; van Dinther, C.; Drzisga, T.; Fey, B.; Flath, C.; Frey, H.; Jeutter, P.; Kammerer, J.; Kern, C.; Muhs, M.; Onken, H.; Praehauser, G.; Rogg, K.; Schönberg, I.; Schumann, D.; Terzidis, O.; Wedler, M.; Weidlich, A.; Weinhardt, C.
Auf dem Weg zum Internet der Energie - Der Wettbewerb allein wird es nicht richten. Smart Grid. Paradigmenwechsel in Deutschland. Quan, D. M.; Terzidis, O.; Klingert, S.
Incentives, business model and required technical infrastructure for the economic aware data Grid. Terzidis, O.; Appelrath, H.-J. ; Weinhardt, C.
WI - Call for Papers Heft 1/2012. BISE - Call for Papers Issue 1/2012. Block, C.; Bomarius, F.; Bretschneider, P.; Briegel, F.; Figawa, N. B.; Fey, B.; Frey, H.; Hartmann, J.; Kern, C.; Plail, B.; Praehauser, G.; Schetters, L.; Schöpf, F.; Schumann, D.; Schwammberger, F.; Terzidis, O.; Thiemann, R.; Dinther, C. van; Sengbusch, K. von; Weidlich, A.; Weinhardt, C.
Internet der Energie : IKT für Energiemärkte der Zukunft; Die Energiewirtschaft auf dem Weg ins Internetzeitalter. Kilian-Kehr, R.; Terzidis, O.; Voelz, D.
Industrialisation of the software sector. Towards an information infrastructure for the future Internet of energy. Brelage, C.; Mayer, P.; Terzidis, O. IT as a Strategic Factor. Filtering for private collaborative benchmarking. Web-Services bringen die Softwareindustrie auf Trab [Interview]. Nalbach, P.; Terzidis, O.; Topp, K. A.; Würger, A.
Elastic response of -tunnelling impurities. Thimmel, B.; Nalbach, P.; Terzidis, O. Rotating wave approximation: Systematic expansion and application to coupled spin pairs. Terzidis, O.; Claudin, P.; Bouchaud, J.-P.
A model for ripple instabilities in granular media. Cubic defects: Comparing the eight-state system with its two-level approximation. The dissipative dynamics of a pair of paraelectric tunnelling impurities. Dynamics of a coupled pair of two-level tunnelling systems. Effective interaction in bosonic systems of quasiparticles in the fractional quantum Hall effect.